Living abroad can play with your emotions. For a time you’ll feel excited, meeting new people and exploring your new home. But after a while, some expats become overcome with homesickness and question why they moved so far away from what they knew. This is what’s known (in New Zealand at least) as the settlement curve. I first heard about “the settlement curve” from an episode of the Expat Sandwich that features Mickey Smith, an American artist living in New Zealand. First of all, if you’ve never listened to the podcast, you should. It’s a great way of diving into the issues and emotions related to moving abroad. Listen to this episode on the Expat Sandwich website here: Episode 005: New Zealand with Mickey Smith. Anyway, in the episode, Mickey casually mentions something called “the settlement curve”. 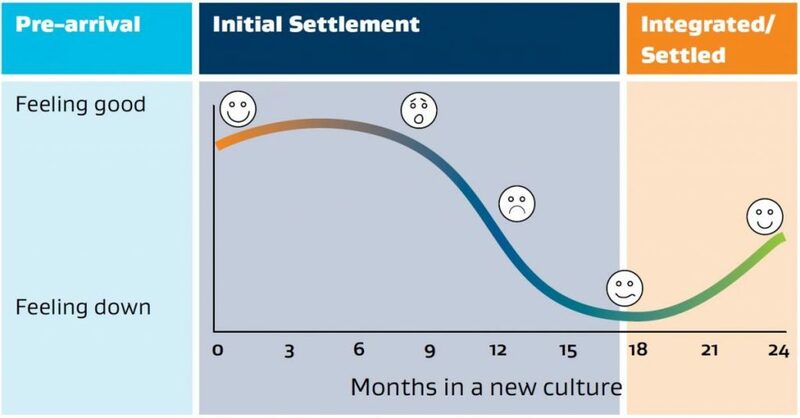 In short, the settlement curve is a way of describing how migrants adjust to a new culture. The curve was developed by the government of New Zealand (official link here: Stages of settling in). I think it was meant to specifically describe how immigrants and expats in New Zealand emotionally react to moving and living there. However, I think it offers some great insights for expats and immigrants around the world. 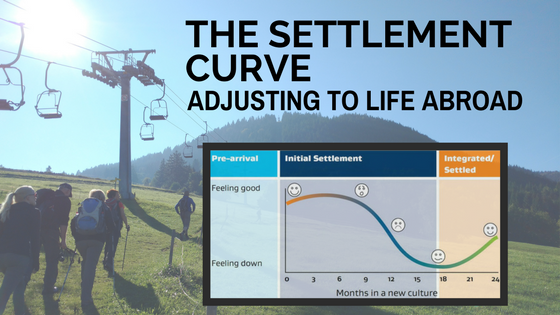 The Settlement Curve, much like an alpine hike, has it’s ups and downs. As you can see in the picture below, it seems to illustrate that expats and immigrants tend to ride high for the first 9 months or so. But for the next 9 months, we apparently dive deep into a sort of funk. As time goes on, we slowly climb back up to being happy again. To me, this seems a little extreme, especially if it’s meant to describe your general mood every day of these 24 months. As in, does the chart mean we should expect to be sad every day from month 12 to 21? I’m sort of playing devil’s advocate here, but only to point something out. I think this chart refers to our emotions regarding the move, not our general emotional state. The “settlement curve” that the NZ government developed. Definitely looks like a roller coaster of emotions to me. I don’t want anyone thinking that every expat or immigrant goes through a 9-12 month depression after moving abroad. Again, I don’t think they meant it in such a hyperbolic way. But it still does seem a little extreme to presume that this is the experience for all or even many expats. They’re probably partially trying to warn the numerous folk who see moving abroad as a “greener pasture” to whisk off to. In that respect, I definitely agree with them. Is the Settlement Curve Right? So how does this reflect my experiences? Not so well. As I said before, this curve is really meant for the specific experience of moving to New Zealand. From what I’ve heard, there seem to be parts of Kiwi culture that might really accentuate the highs and lows of the curve. In the episode of Expat Sandwich, Mickey goes on to tell us that NZ just feels a little more disconnected. Of course, it is literally more disconnected, being a smaller island in the massive Pacific. But there seems to be something else that separates it from the pace and goings on in other parts of the world. The thing is, I’ve never really felt “disconnected” here in Germany, and I’ve never really felt homesick. I’ve never been to New Zealand, but one of my best friends here is Kiwi. She agrees that Germany feels much more a part of the world’s events than little ol’ New Zealand. There’s also the fact that Germans are surprisingly well educated and interested in the world’s cultures and history. Geographically speaking, from Germany it’s easy to go anywhere else in Europe. However, it’s a 3 and a half hour flight from Auckland to Sydney, the closest Australian city. I think that proximity really influences people’s mindset, and that distance from other places really influences Kiwi culture. Maybe it acts like gravity, the closer you are, the stronger that attraction force is. I know Kiwis aren’t disinterested in world events and history, but there does seem to be a “distance” between them and say, the pace of Europe. So maybe the curve has much more relevance in New Zealand than it would for many other adopted homes for expats. As I said, it doesn’t depict my emotional reaction to moving abroad. However, the settlement curve does reflect the general shape of the learning curve I’ve gone through to understand German language and society. So I do accept that there is some correlation there. All that being said – I know my experience doesn’t necessarily reflect everyone else’s, even those also living in Germany. I know there are immigrants and expats here who are homesick or even depressed, questioning themselves and their decisions. Conversely, there are certainly also expats and immigrants in New Zealand who never really fall off that first high. No one factor can be singled out as the basis for our emotional response to moving away from what we called home. However, there are probably a few very important things at play. Some of these are the situation at “home” before leaving, the reason for moving away, personality types and how we deal with stress, isolation, and anxiety, and of course, the specific circumstances of the place and the life we are moving to. Okay, okay, yes I definitely know I’m not that “normal”, whatever that means. Hell, what percentage of Americans even leave the country, let alone move abroad? But that’s not what I really mean with the heading. What I mean, is that I know my situation isn’t normal. First of all, I’m in a very international master’s program. Everyone in my program, except for the few locals, is in the same boat (or rather, freshly off of it). We’re all new here and adjusting to life away from home, in Germany, so it’s easier for us to become fast friends. I also have another advantage. I lived with some great Germans in my first apartment here in Munich. Somehow, one of them ended up liking me enough to date me to boot. That’s always a plus. 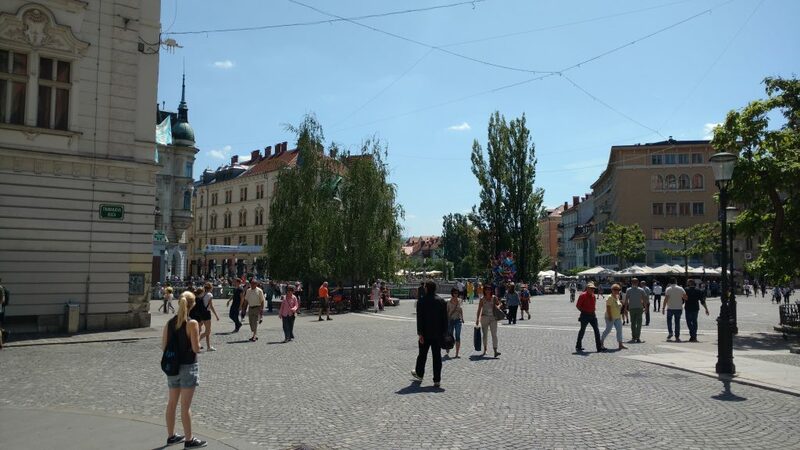 The central square of Ljubljana with the Triple Bridge in the background. And in the foreground, my girlfriend, travel partner, and best friend. She has helped me smooth the ride along the “settlement curve” as I adjust to life abroad. So now I have her anchoring me to Munich. She’s German, but not from Munich, so there is an aspect of this city being both of our adopted hometowns. Still, having a girlfriend (who’s my best friend) here has really made it much easier to deal with life’s ups and downs. If I wasn’t in my particular program, or if I hadn’t moved into that shared apartment in October two years ago, I’m sure I would feel very different about moving here. Everyone has their own experiences. If you’ve moved abroad, what has yours been? Leave me a comment below if you have any questions about adjusting to life abroad or the reality of the settlement curve. Or, if you’ve already moved abroad (especially if you’ve moved to New Zealand! ), I really want to hear about your experiences adjusting to your new home – please share! This is really interesting. As an American expat in Croatia, most of my worries have concerned how my kids are adjusting. I love it here, but maybe I am riding the high of a newcomer. Having your own kids along is a whole different can of worms I’d imagine – the good news is it seems to give you something to focus on other than what you left behind. Keep focused and you won’t get caught down in the dumps. Thanks for commenting! Great post. I do think that people expect moving abroad to be nothing short of amazing. This is a great post on the more realistic side of it! Thanks Michele – and yea, that’s exactly why I shared it! Part of that issue is our, the travel and expat blogger’s, fault. It’s good to be positive, but as the Settlement Curve portrays, there are some real challenges to adjusting your lifestyle and fitting into a new place, as much fun as it is to move somewhere new. It comes with a price: more time and effort put into new relationships, understanding a new society, and often learning a new language to boot. Clearly not just a walk in the park, so to speak. Interesting post. This is something what I used to tell my friends, although I never used a graphical representation, to let them know the challenges of settling outside their own country. It is not only a physical change, but it is more psychological. You are exposed to a change at a ‘fundamental level’. Food, language, weather.. I think that grumpy face from 12-21 indicates that, although I still wonder, what would take someone 12 months to stop liking some place; it should start happening within the initial months itself, as one started struggling with the fundamentals. I am considering living abroad someday. Thanks for sharing this. You’re most welcome! Thanks for commenting – I hope it was helpful. Hi, I moved to NZ at the end of last year with my Kiwi husband and two kids. I’m Irish but we met and lived in London for 17 years. I’m really, really struggling here (never really got the high sadly) and really appreciate your blog. I think you’ve summed up brilLlanllyfni what I’very been feeling about the physical and psychological distance here. It is just a step further than anywhere else. Thank you for making my feelings feel normal and acceptable. Kiwis are very patriotic and don’t take criticism well so don’t reallyou get that I don’t love/like it here. I feel very isolated. I’m also glad to hear that what I surmised about expat life in NZ is real – but I really feel for you. I had also imagined that Kiwis wouldn’t quite get this struggle, as it would just seem totally normal to them. At least for most of the Kiwis that live there – many who move abroad feel the same as us. I feel that generally, Kiwis already feel a bit isolated from the world, but are pretty cohesive within the islands and already have their own cliques and groups. I guess it might be hard for them to see how this is not a conducive environment for expats and immigrants. To sympathize a little bit – I have had plenty of situations with Germans when I’ve felt ignored. Sometimes, German people I meet at parties just don’t engage with me seriously or openly, unless we have a close mutual friend or there is some other reason to advance past the “I don’t know you” phase. This is not always because I’m American, in fact, that probably gives me an extra “interesting factor” to some Germans. There is a well-known analogy that Germans are like coconuts and Americans are like peaches. I used to discount it but I think there is definitely some truth to it. Being a non-German makes it even harder to break that harder shell (though again, definitely not all!). I’m sure you’ve heard all the typical mantra before of “join groups & activities! etc. so I won’t bore you with those. I just wanted to thank you for warming my heart. Please, contact me anytime you want to reach out to someone else living in a foreign land. Although I have had a much easier time than you have, it seems. Keep strong! Sorry predictive text inserted a few strange spellings on my last comment. I meant “summed up brilliantly”. That graph is incredibly accurate. Most of the expats I’ve meed over here in COlombia have told me their stories and I think most of them have gone through the same roller coaster of emotion.